Last Monday, Day 214, my post was about supply and demand. I promised to keep track of my efforts to avoid being wasteful all week and let you know how I went. The idea is to lower the demand for items therefore lessen the necessity to supply them. I avoided using throw away utensils and containers when eating out. Luckily at most cafes here in Australia coffee comes in china cups unless you order it to go and they have metal utensils so this wasn’t difficult to achieve. As usual I didn’t bag up my fruit and vegetable when at the supermarket so no plastic bags wasted here. I also took my own carry bags to the supermarket so once again no plastic bags wasted. I walked to work on Thursday and car pooled on Monday saving some gas. I mended two items of clothing so they could be worn again instead of being replaced. I returned some wire coat hangers to the drycleaners so they could be reused. I used Tupperware containers to store some individual chicken breast fillets in the freezer rather than putting them in plastic freezer bags like I normally would. I will be doing this all the time in future. I ate porridge for breakfast all week to use up some oats that were getting a little old in the cupboard. I would have bought a new packet of cereal otherwise. We have been eating “end of day” bread all week that was given to my son by a friend who works at a bread shop. This bread would have ended up in a dumpster otherwise and I would have bought fresh bread. I oiled and seasoned the vegetables before roasting in a bowl rather than in a plastic bag like I usually would. Once again I will be doing this all the time in future. I have been buying my meat at the butcher where even though they still put the cuts in a plastic bag they don’t use Styrofoam trays. Another new habit I will stick with. Actually I might take my own container in future eliminating the plastic bags altogether. Aside from groceries and a new lid for my skillet I bought nothing else all week. This has become the norm for me though. My husband spent the last three weeks in Hawaii and as instructed bought me back no gifts. He does want to buy me a new iPad to replace this laptop that I write my blogs on but this old faithful is going to have to falter more than it already is before I will let him replace it. I am getting used to its little quirks anyway and maybe some times I have to wait a while for it to load things but that is not to bad. I know all this may not seem like much in the big scheme of things but if everyone made a little more effort to cut back the world would be better for it. 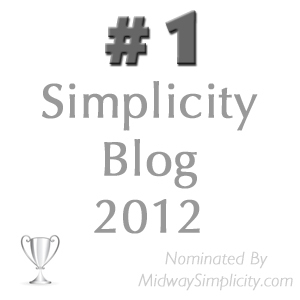 I am quite happy with my efforts and I pledge to continue to find more ways to improve. 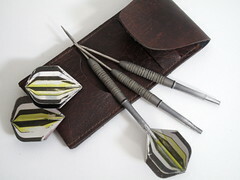 I don’t know how many year it is since my husband used this dart set. Fantastic job Colleen!!! You’ve reminded me to throw a Tupperware in the car because we’re going to dinner at a restuarant to celebrate my youngest’s 8th birthday, and I know there will be leftovers. good for you, planning ahead. My son loves to eat at a certain Indian cafe and I wish we could take our own containers there for when we get take-out. I know the containers they use there can go in the recycling but it is still such a waste. Hey Colleen supply and demand week looks like it went really well. You’ve given me a great suggestion to give back wire hangers from the dry cleaners. I take my work shirts there almost every week and I have a bunch of the wire hangers in my closet, so I will definitely be taking those back! As for me, the only free thing I took all week was 2 boxes of Fiber 1 bars they have been passing out in my city all week but other than that, I said no to all forms. I’m really happy the week was good for you. good for you it sounds like you did well last week also. The fiber 1 bars were consumable so that’s OK.
My husband bought back one gift for our son while he was in Hawaii and that was two boxes of ghirardelli bownie mix. My son couldn’t think of anything he needed but my husband came back with something that was not only consumable but that he knew my son would really enjoy. I was deleighted with how thoughtful that was. You are definitely a woman after my own heart. What a nice, solid week. We do much the same here, avoiding plastic bags like crazy, and oiling veggies in a bowl instead of a baggie. One thing I do wish we had more of are the Pyrex bowls with fitted lids, but I’m on a buying moratorium. thanks for the encouragement. The effort seems so little sometimes but it makes me feel good to be making it. Every little thing helps. I have old fashion pyrex bowls without lids too. Have you taken your bowls to the kitchen shop to see if the lids will fit your old bowls or maybe waxed paper held on with an elastic band would work just as well a plastic wrap as a cover. If you have fabric ends and like to sew, you can make fabric bowl covers – just hem a square large enough to cover the bowl and down the sides about 1/3 of the way, then use an elastic band to hold it on tightly. Can be washed with the dishtowels, so no extra washload is needed. Two sizes should cover most bowls. Or just use a cloth napkin and elastic band. thank you also for the encouragement. I was more concerned about sealing the moisture in. Would this method be effective for that or would food dry out because the moisture can escape? Ah, sorry, I was thinking about taking foods to something like a potluck or to someone’s home. Definitely not a good idea for something that you need to keep moist! actually I am trialing paper lunch wrap, I have it covering some homemade pizza in the fridge at the moment. Hopefully it will be OK. Even though it is still a processed one-use product at least it does take a years to degrade like plastic wrap. I’ll let you know how it goes. Thanks for your idea though I am sure it works just fine because I have taken plenty of things to potlucks wrapped in tea towels before. What an inspiring post Colleen! I simply don’t have enough containers, so still use some plastic bags, although sparingly. This past week I stopped using lipstick and mascara, so did make a little headway. Have used them since high school, so we are talking many years!! What an awesome gift your hubby brought your son. thank you for the kind words. I probably won’t ever stop using mascara or lipstick but I only ever have one on the go at a time and I use it sparingly. Days off are makeup free days unless I am going somewhere special. If I don’t put eyes on I look like a moonface. Colleen, you are doing a great job, and these are good tips! Can I have your husband’s old dart set if he doesn’t want it anymore. I play darts at the community hall where I live. If this is okay perhaps Amber could pass them on to me. yeh sure I will give them to her when I see her next. Luckily they haven’t gone to the thrift store yet. I have given them to Amber to give to you. I love your ideas! Whenever people ask me what they can bring me (from a trip or for a little gift) I like to tell them “nothing” (though some people don’t like that response) or I suggest something that can be consumed and thus disappear — nice food items, or bars of lovely soap — nothing that has to stick around forever. that is a good way of pleasing the giver without ending up with clutter. 1) how amazing is it that Leanne could use your husbands dart set again. I love if you can get rid of stuff and k n o w that someone else is actually using it again. I will have a wish for christmas: I want to get a thermos cup to get my coffe in at the cafeteria in my library where I sit most of the days during the week, writing my thesis. I need coffe at least twice a day, and the disposables are making me feel bad so often. So my next years resolution is to bring my thermoscup. I hope I can manage that. 1) It is good to know that Leanne could use those dart. That is one of the things I love about volunteering at the thrift store. I see my stuff go out the door with a new owner nearly every time I go in there. It is good to know the stuff has a new owner and even better to know that it might of been an item the new owner would have bought new if they hadn’t found my cast off. 2) It wasn’t really a big step just a series of little ones and I am getting better and better all the time. Since then I have also stopped using paper towel to clean the toilets and to put over things in the microwave. I use my microfibre cloths and a plastic lid instead. Even my son has adapted to the lid idea and is not wasting so much paper towel. I haven’t eliminated it altogether but a roll last much longer now. I have a 60m long roll of plastic wrap which I started using (I wrote the date on it) on 15 Dec 2010 and there is still plenty left. My 30m roll of aluminium foil has been used since May 2011 and I don’t think I would have used more than a 5m of it. When I bring meat home from the butcher I separate it into into meal size batches and put it in reusable pastic containers rather than using freezer bags. My latest effort is to through my vegetable scraps into my garden rather than in the bin. My bin liner should last for the whole week now rather than using two. I am still getting used to this habit and often have to fetch the peelings back out of the bin after I realise that I have succumbed to the force of habit of throwing them in there. I could just leave them there and try to remember next time but I figure that the more effort it takes to fetch them out the better I will be at remembering in future. I received the added joy of finding a little Blue Tongue lizard out among the scraps the other day so that was good encouragement. I like your Christmas wish of a thermos cup. What a great way to save on throw away cups. Most cafés that I frequent here in Aus serve coffee in proper cups and I don’t usually get coffee to go so I don’t have this problem. Now if I could convince the curry takeout to let me bring my own containers for the meals I buy there I would be a very happy lady.